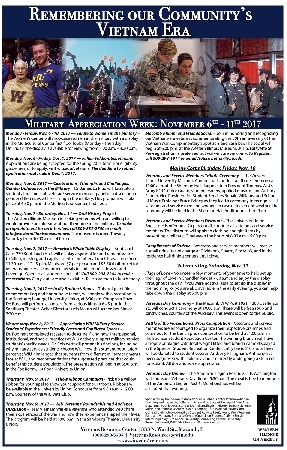 MACOMB, IL -- Western Illinois University will commemorate Military Awareness Week Monday-Saturday, Nov. 6-11. The events are sponsored by the WIU Veterans Resource Center, which helps veterans, service members, military family members and the University and surrounding communities. 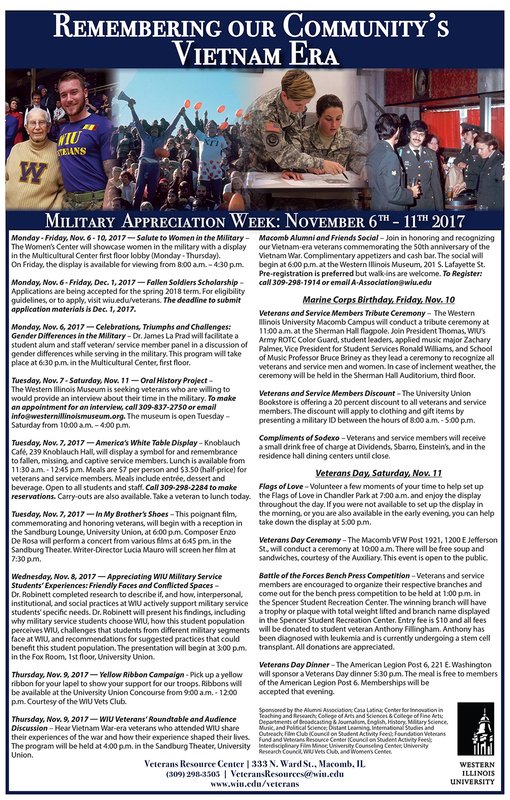 • Monday-Friday, Nov. 6-10: "Salute to Women in the Military – The WIU Women's Center will showcase women in the military with a display in the first floor lobby of the Multicultural Center. The display is open for viewing from 8 a.m.-4:30 p.m. Friday, Nov. 10. • Monday, Nov. 6-Friday, Dec. 1: Fallen Soldiers Scholarship Applications – The deadline to submit application materials is Friday, Dec. 1. For eligibility guidelines, or to apply, visit wiu.edu/veterans. • Monday, Nov. 6, 6:30 p.m., first floor of the Multicultural Center: "Celebrations, Triumphs and Challenges: Gender Differences in the Military" – WIU Educational Studies Professor James La Prad will facilitate a panel discussion of students, alumni, staff and veterans/service members to discuss gender differences while serving in the military. • Tuesday-Saturday, Nov. 7-11: "Oral History Project" – The Western Illinois Museum is looking for veterans who are willing to be interviewed about their time in the military. To make an appointment for an interview, call (309) 837-2750 or email info@westernillinoismusuem.org. The museum is open from 10 a.m.-4 p.m. Tuesdays through Saturdays. • Tuesday, Nov. 7: "In My Brother's Shoes" – This film, which commemorates and honors veterans, begins with a reception in the University Union Sandburg Lounge at 6 p.m. Composer Enzo De Rosa will perform a concert from various films at 6:45 p.m. in the Sandburg Theatre, and a screening of the film begins at 7:30 p.m.
• Wednesday, Nov. 8, 3 p.m., University Union Fox Room: "Appreciating WIU Military Service Students' Experiences: Friendly Faces and Conflicted Spaces" – WIU Recreation, Park and Tourism Administration Assistant Professor Jeremy Robinett completed research about if and how interpersonal, institutional and social practices at Western actively support military service students' specific needs. He will present his findings, including why military service students choose WIU and suggested practices to benefit this student population. • Thursday, Nov. 9, 9 a.m.-noon, University Union Concourse: "Yellow Ribbon Campaign" – Yellow ribbons will be available to show support for our troops, courtesy of the WIU Vets Club. • Thursday, Nov. 9, 4 p.m., University Union Sandburg Theater: WIU Veterans' Roundtable and Audience Discussion: Vietnam War-era veterans who attended WIU share their experiences of war and how they shaped their lives. • Thursday, Nov. 9, 6 p.m., Western Illinois Museum, 201 S. Lafayette St., Macomb Alumni and Friends Social: Vietnam-era veterans will be honored to commemorate the 50th anniversary of the Vietnam War. There will be complimentary appetizers served and a cash bar will be available. Registration can be completed by calling (309) 298-1914 or by emailing A-Association@wiu.edu. • Friday, Nov. 10, 11 a.m., Sherman Hall flag pole: Veterans and Service Members Tribute Ceremony – A tribute ceremony to all veterans and service men and women will be presented with special guests WIU President Jack Thomas; WIU Vice President for Student Services Ron Williams; WIU's Army ROTC Color Guard; student leaders; applied music major Zachary Palmer and School of Music Professor Bruce Briney. In case of bad weather, the ceremony will be moved to the Sherman Hall Auditorium on the third floor. • Friday, Nov. 10, 8 a.m.-5 p.m. University Union Bookstore: Veterans and service members will receive a 20 percent discount on clothing and gift items by presenting their military identification. • Friday, Nov. 10: Sodexo will provide veterans and service members with a free small drink at Dividends, Sbarro, Einstein's and in the residence hall dining centers. • Saturday, Nov. 11: Flags of Love – To mark Veterans Day, the Flags of Love will be put up in Chandler Park. Volunteers are needed to put up the flags at 7 a.m. and to take them down at 5 p.m.
• Saturday, Nov. 11, 10 a.m.: Veterans Day Ceremony – The Macomb VFW Post 1921, 1200 E. Jefferson St. Free soup and sandwiches will be served, courtesy of the VFW Auxiliary. The event is open to the public. • Saturday, Nov. 11, 1 p.m.: Battle of the Forces Bench Press Competition – Veterans and service members will have a bench press competition in the Spencer Student Recreation Center. The winning branch will have a trophy or plaque with the total weight lifted and the branch name displayed in the Recreation Center. The entry fee is $10 and all proceeds will be donated to a student veteran who is battling leukemia. • Saturday, Nov. 11, 5:30 p.m.: Veterans Day dinner – American Legion Post 6, 221 E. Washington St., will provide free meals to members of the post. Memberships will be accepted that evening. Military Appreciation Week activities are sponsored by the WIU Alumni Association; Casa Latina; the Center for Innovation in Teaching and Research; the College of Arts and Sciences; the College of Fine Arts and Communication; the departments of broadcasting and journalism, English, history, military science, music and political science; School of Distance Learning, International Studies and Outreach; the WIU Film Club; the Foundation Veterans Fund; the Veterans Resource Center, the interdisciplinary film minor; the University Counseling Center, the University Research Council; the WIU Vets Club and the WIU Women's Center. For more information about any of the activities, contact the Veterans Resource Center at (309) 298-3505 or by email at VeteransResources@wiu.edu.